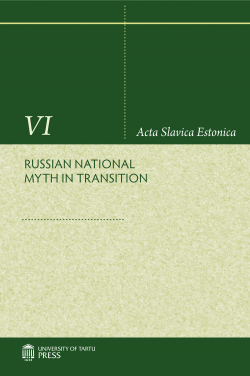 This volume is part of the sub-series Studia Russica Helsingiensia et Tartuensia, XIV, and unites scholars from Estonia, Finland, Russia, Ukraine, Germany, and Canada who belong to the tradition of the Tartu Lotman school. This collective monograph explores the development of national myth on the basis of a variety of materials from Russian culture, beginning from the Late Middle Ages and finishing with the Soviet epoch. The main part of the study is devoted to the Imperial period — the epoch during which the notion of nation arises. Analyzing the mechanisms used to construct national ideology, the authors especially stress the participation of literature and art in nation building: the role of the press, theatre, writers and their works in their dependence upon historical matters and political conjuncture.